What is a light microscope? A light microscope is a gadget, which one can use to enlarge very small objects, to make them visible for the human eye. The term consists of the two ancient Greek words mikrós = tiny and skopeín = to regard something. All microscopes have in common, that they consist of at least one optical lense. If one wants to know, how a microscope works, one has to understand the principle of optical enlargement. Basis for the optical enlargement is the fact, that light rays don´t always run straight-lined. When light passes over form one transparent material to another, then it sometimes changes it´s course. This is called: light “refraction”. One can see that in the picture with the straw in the glass. 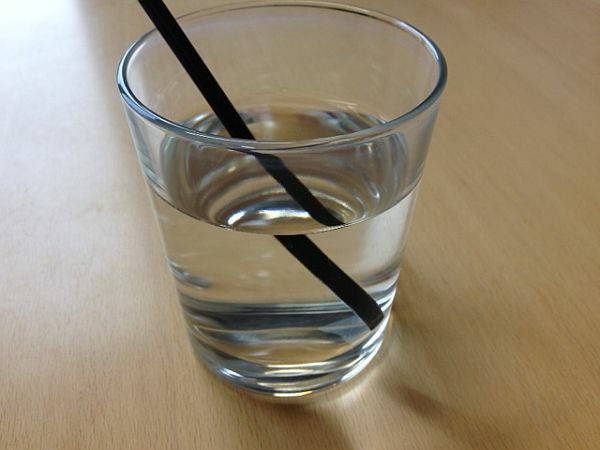 The straw looks distorted, as the water changes the course of the light. If one wants to use this effect for optical enlargement, the first step is to achieve a controlled refraction of light. Over the last 500-800 centuries people have found out, that oval, transparent materials, so called lenses, are the most practicable to use. Their qualities and effects on the course of light are very well examined. This makes it possible, to intentionally trigger the effect of optical enlargement. It even enables us to predict and to forecast the increase factor precisely. 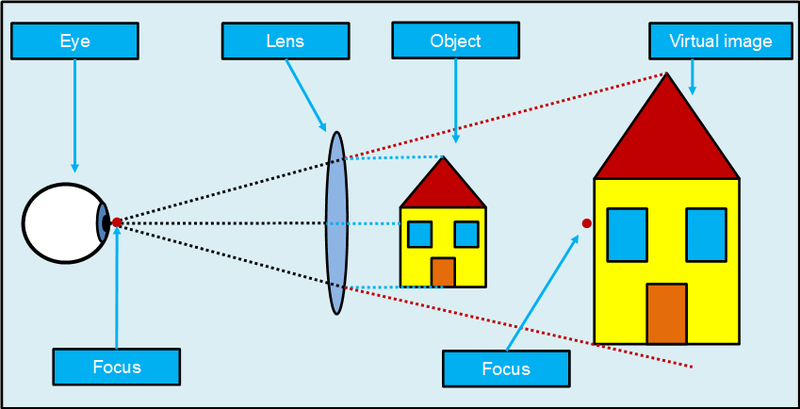 The picture shows the enlargement of a house, by using one lense, like a magnifier. Elliptical lenses have the property to collect parallel light rays (BLUE LINES) into one point (BLACK LINES), the so called focus. For the viewer, it makes it look as if the rays come from another direction (RED LINES). This makes the object look larger, than it is in real. Microscopes use the same principle to generate a picture. The difference is, that most of them contain a combination of two or more lenses. They have a special arrangement, so that they create an enlargement of the enlarged picture. 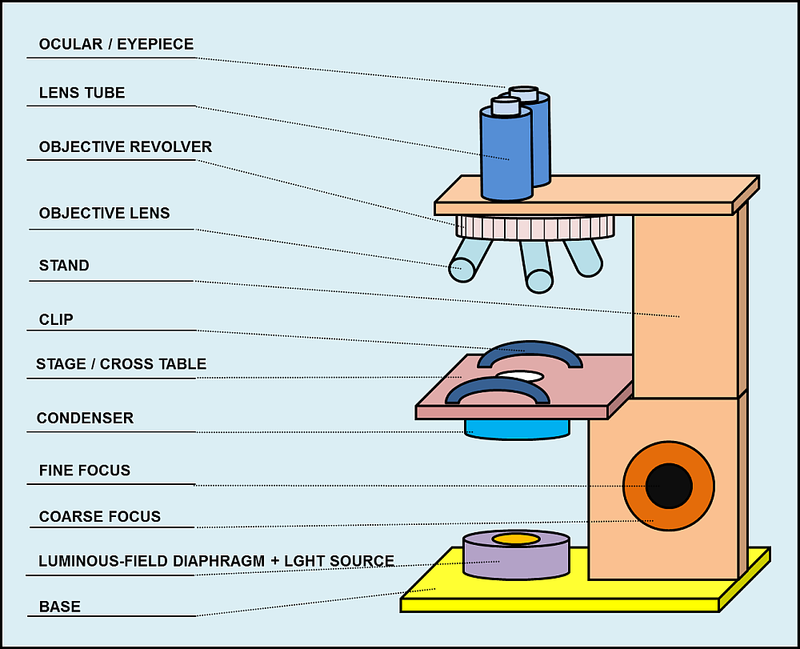 The structure of light microscopes is often similar. The most usual components are: eyepiece, lens tube, objective revolver, stage, table, condenser, fine focus, coarse focus, luminous-field diaphragm, base. The commonalities go so far, that some microscopes make use of standardized components, which one can use also on other microscopes. Microscopes are often a part of physics or biology classes. Therefore, I have created a PDF, which you can use to exercise and to learn the components of a microscope. You can download them, copy and forward them for free – for noncommercial purposes. The history of the light microscopy can´t be told with a few sentences. It is not a short story of one brilliant inventor, who woke up at night, as he had a vision and then ran down in his workshop to build a microscope. The evolution of the microscope technology took hundreds of years is closely connected to the development of telescopes, which were built to explore the far distant sky and not the microcosms. 1000 People begin to use “reading stones”. Wise people discovered the enlarging effect of oval formed glass. 1200 The first eyeglasses, like we know them today, are manufactured. 1608 The Dutch refraction telescope was invented. This construction contains 2 lenses and can be used for the far distance and as microscope. 1860ies German scientist Ernst Abbe scientifically investigated the principles of optics. From this time on, microscopes could be manufactured in series. It is also very fascinating to see the influence of the evolving microscope technology on the progress in medicine. William Harvey discovered the system of human blood circulation in the 17th century. His theories could be proven my Marcello Malpighi, by using a microscope. Roberk Hooke discovered “cells” as elementary components of creatures. After Athanasius Kircher had examined the blood of pest patients, he suspected very small, invisible organisms to cause the infection. He developed new hygienic measures to avoid a further dispersion of the disease.